Protesters march down Massachusetts Street as part of a rally against President Donald Trump's immigration policies on Saturday, June 30, 2018. 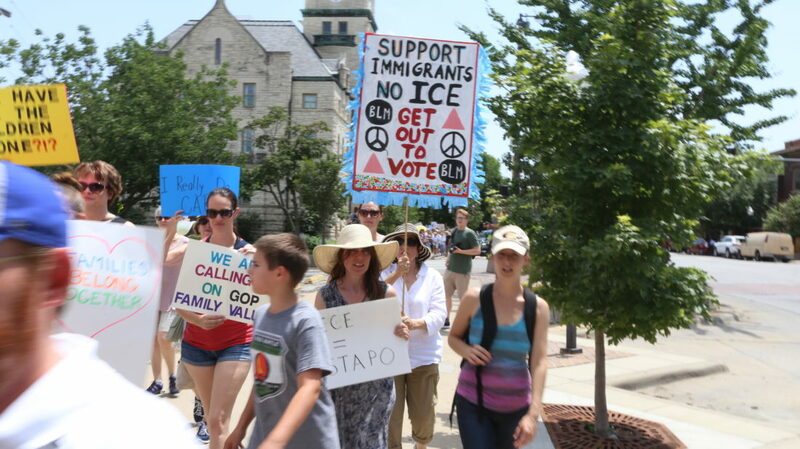 About 700 people attended a rally in South Park and marched down Massachusetts Street on Saturday to protest President Donald Trump’s “zero tolerance” immigration policies, despite temperatures that soared into the mid-90s by midday. 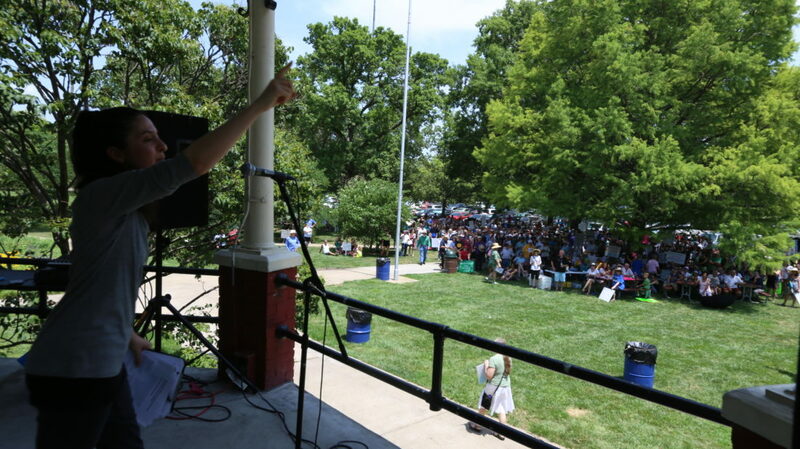 Speaking from the South Park gazebo, Kim Erwin, an activist with Families Belong Together and one of the organizers of the rally, told the crowd huddled under shade trees they were attending one of 700 rallies in the nation demanding an end to the Trump administration’s policy, which had detained and separated Central American families seeking asylum in the United States. The policy had Immigration and Customs Enforcement agents separating children from their parents until Trump ordered an end to family separations on June 20 in response to widespread public outrage. Erwin said that the crisis wasn’t over and that Families Belong Together was demanding that the immigrant families be reunited and the mass detentions of refugees end. She also noted that Trump has suggested he would like to pursue mass deportations that would deny many immigrants a hearing. “Trump has floated on Twitter the elimination of due process rights, and we know that is not going to fly,” she said. Activist Kim Erwin with Families Belong Together speaks from the South Park gazebo at a rally opposing President Donald Trump’s immigration policies on Saturday, June 30, 2018. Erwin was one of the organizers of the event. Erwin and Families Belong Together worked together with the KU chapter of Amnesty International to organize the protest, which included speeches from some local government leaders. And in her remarks to the crowd, City Commissioner Jennifer Ananda said that her previous experience working in immigration law had taught her that most of the Central American refugees detained at the border were fleeing life-threatening violence in their homelands. “These individuals put their trust in our country, and we should strive to be a country worthy of that trust — a country where families are valued, where life is valued and all human beings are valued,” she said. Her husband said they were both determined to push back against the zero tolerance policy as the midterm elections draw nearer.